Private consumption is driven by wage growth while export growth is driven by Eurozone demand and the country´s improved international competitiveness. Since January 2014 the Czech Republic is ruled by a centre-left coalition, holding 111 of the 200 seats in parliament. The coalition is led by the leftist Czech Social Democratic Party (CSSD), the other two parties are the centrist ANO 2011 and the Christian Democrats (KDU-CSL). Next general elections are due to be held in October 2017. 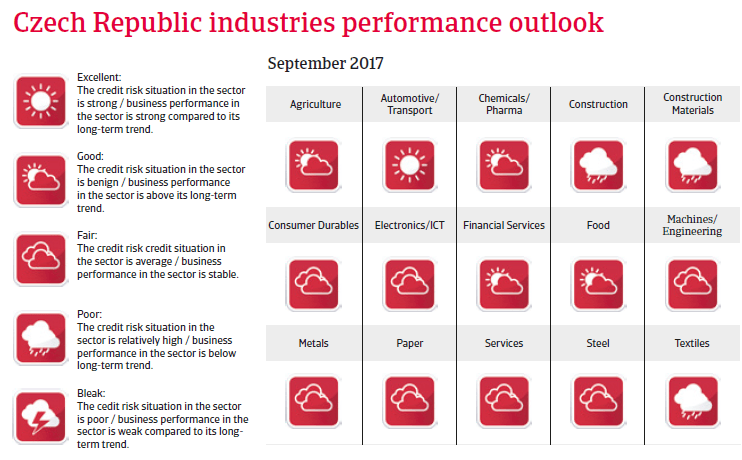 In 2017 Czech economic growth is expected to increase 3%, benefitting from robust private consumption, a rebound in private and public investment and buoyant exports (especially automotive related goods). 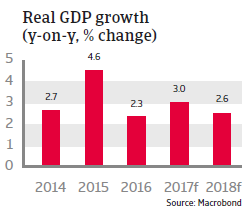 In 2018 continued robust GDP growth of 2.6% is forecast. Domestic demand is expected to remain robust. Private consumption growth is driven by wage growth, decreasing unemployment and favourable lending conditions. 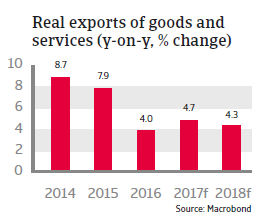 At the same time export growth is set to continue, driven by demand from the eurozone and the country´s improved international competitiveness. In April 2017 the central bank abandoned a cap (currency ceiling level) on the koruna against the euro amid rising inflation and robust economic growth. The cap was introduced in November 2013 in order to improve the country´s competitiveness, boost exports and contain deflationary pressures. Further rising inflation due to surging wages and rising house prices led to an increase in the benchmark interest rate from 0.05% to 0.25% in August 2017- the first rate hike since 2008. Government finances are solid, with a small budget surplus reached in 2016 due to income growth and increased tax compliance. In 2017 and 2018 small deficits are expected due to higher public expenses and investments. At 36% of GDP, government debt is low compared to other countries in the region. The good state of public finances means that the Czech Republic should have no troubles adhering to the adoption criteria of the euro. However, entering the eurozone still remains a controversial issue in Czech politics, with public opinion against it. Therefore, a eurozone entry in the coming years seems unlikely. Despite the generally benign outlook, downside risks remain. At more than 75%, the Czech Republic’s export-to-GDP ratio is one of the highest in the EU, and due to foreign investment, the Czech economy is highly integrated into international value chains. This makes the country vulnerable to foreign trade losses. 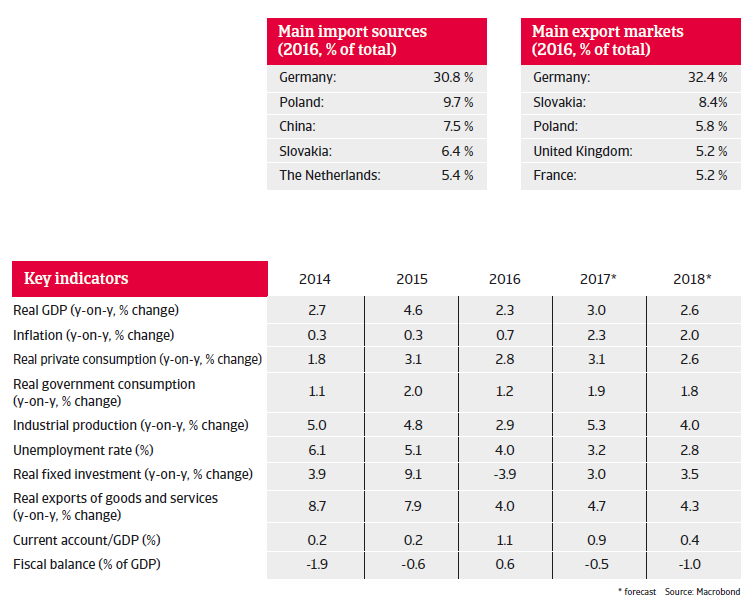 The main risks in this respect are a strong exchange rate appreciation hurting Czech international competitiveness and sharp external demand decreases, e.g. triggered by increased political uncertainty (Brexit), or a sudden slowdown in the eurozone.